Puffin has long disappeared from English culinary repertoire. The birds are now a protected species in the UK, and emotions run high when it comes to eating them abroad. In 2008, television show The F Word followed Gordon Ramsay to Iceland, where he learned to hunt puffins using traditional methods and sampled raw puffin heart. In response, UK media regulator Ofcom received 42 complaints. There were no such sensibilities back in the Georgian era. 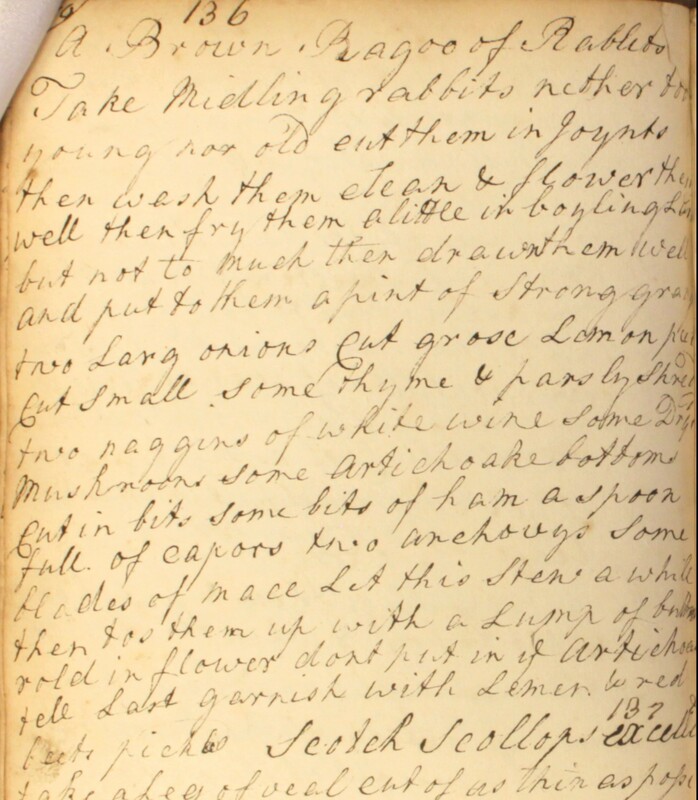 People had been enjoying pickled puffin, without scruple, for centuries. In fact, the British taste for puffin dated back to the Middle Ages. With much of its life spent in and on the water, medieval theologians classified the seabird as a fish. 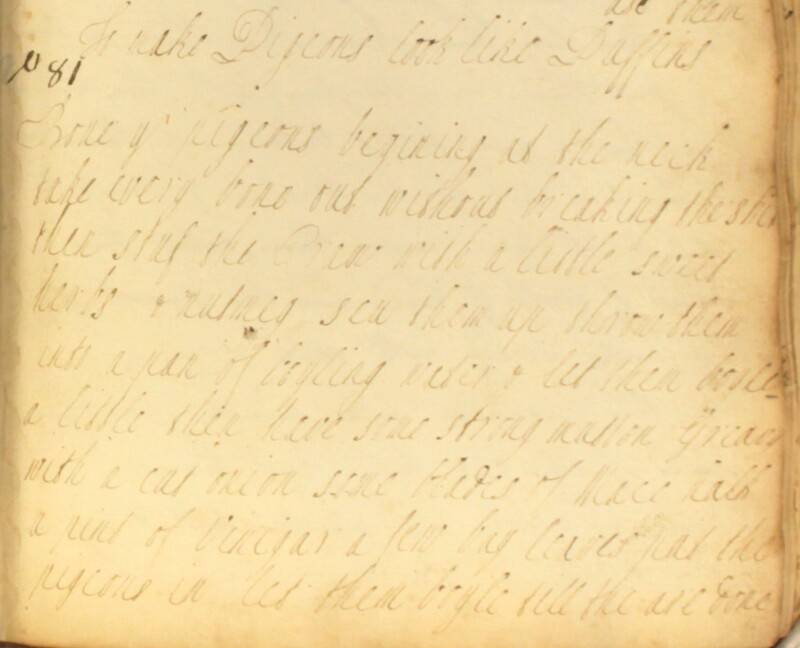 As a result it could be enjoyed on fasting days and throughout the period of Lent, when eating meat was prohibited. In the 18th and 19th centuries, pickled puffin became a very fashionable food. Over the centuries, the inclusion of puffin meat at state banquets and royal feasts – such as the coronation dinner of King James II – had elevated the dish’s status to that of gastronomic delicacy. Pickling was a practical way of preparing and serving the bird. Not only did it help to preserve the meat, but it also went some way to mask the powerful fishy taste. Bone yr pigeons begining at the neck. Take every bone out without breaking the skin. Then stuf the cram with a little sweet herbs & nutmeg. Sew them up, throw them into a pan of boyling water & let them boyle a little. 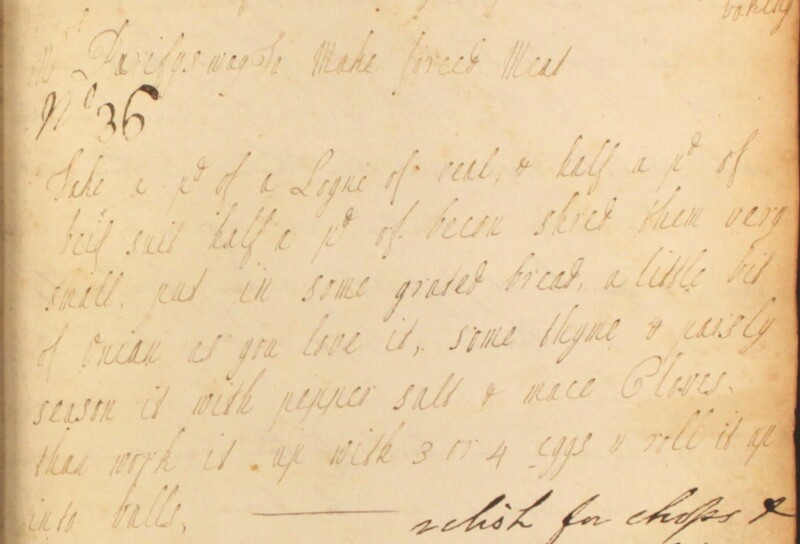 Then have some strong mutton greavy with a cut onion, some blades of mace, half a pint of vinigar, a few bay leaves. Put the pigeons in. Let them boyle till the are done, then take them out & lay lay them in a cro[k]. Boyle the lqr a little longer. When cold, put to the pigeons, cover them close. If you keep them any time, boyle the pickle again & put it to them when cold. Carroll’s wacky invention of a living and breathing ‘mock turtle’ in Alice’s Adventures in Wonderland couldn’t have failed to raise a smile among his contemporaries, and the creature’s ‘Turtle Soup’ song is a wonderful send-up of the Victorians’ predilection for mock turtle soup. Mock turtle soup had its origins in the mid 18th century, when it was a cheap alternative to soups made with real turtle flesh. Offal and eggs were prepared to resemble the texture of turtle meat and served with a rich veal or mutton broth. By the time Carroll published Alice’s Adventures in 1865, it was no longer regarded as a poor man’s alternative – mock turtle soup had become a delicacy in its own right. Boil four eggs ten minutes & put them into cold water. 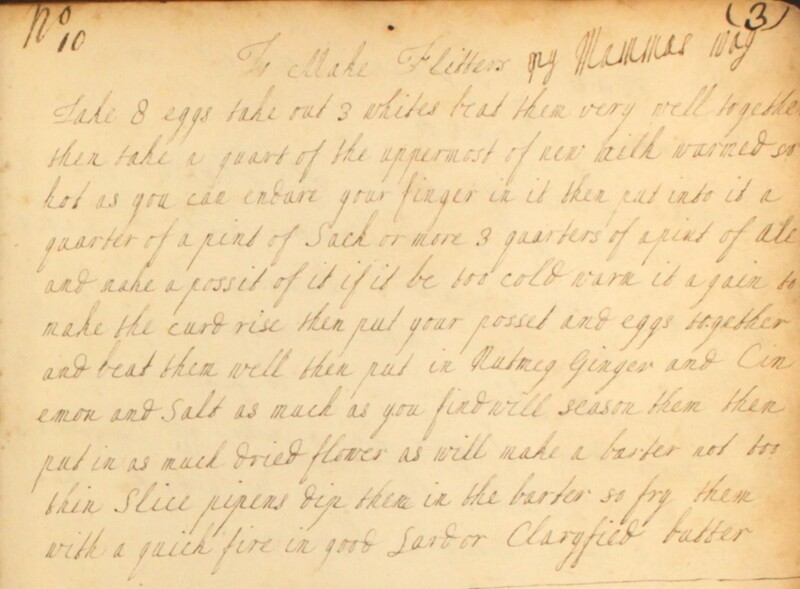 When cold, put the yolks into a mortar with the yolk of a raw egg & a teaspoonful of flour, same of chopped parsley, some salt (what will lie on a shilling) & a little pepper. Roll them into small balls (for they swell in boiling). Boil them a couple of minutes. Forcemeat was used as a tasty garnish and stuffing in many Georgian dishes, from calf’s head hash to rather more dainty côtelettes à la Maintenon. We’ve even see it used to form a lid over a dish of baked snipes. 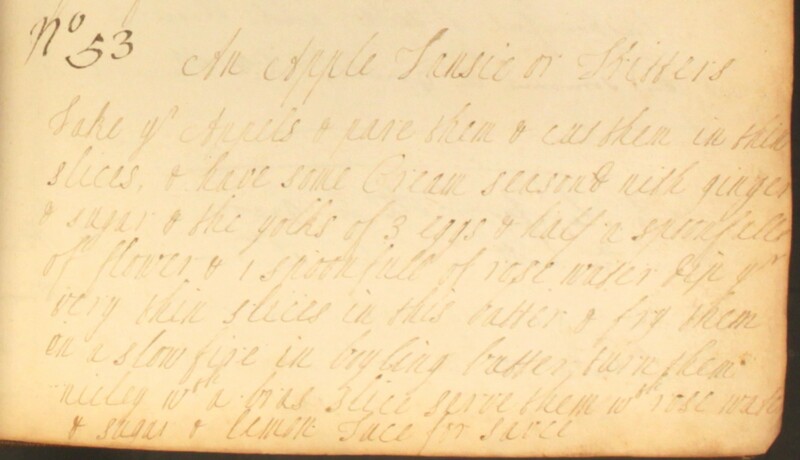 The earliest recipe in our Cookbook is attributed to a Mrs Purify (possibly a spelling variation of Purefoy). Here she shares her way of making ‘forced meat’. These small rolled balls of minced meat are packed with flavour: seasonal herbs, bacon, chopped onion and plenty of seasoning. Take a pd of a loyne of veal & half a pound of beef suit, half a pound of bacon. Shred them very small. Put in some grated bread, a little bit of onion as you love it, some thyme & parsly. Season it with pepper, salt & mace, cloves. Then work it up with 3 or 4 eggs & roll it up into balls. 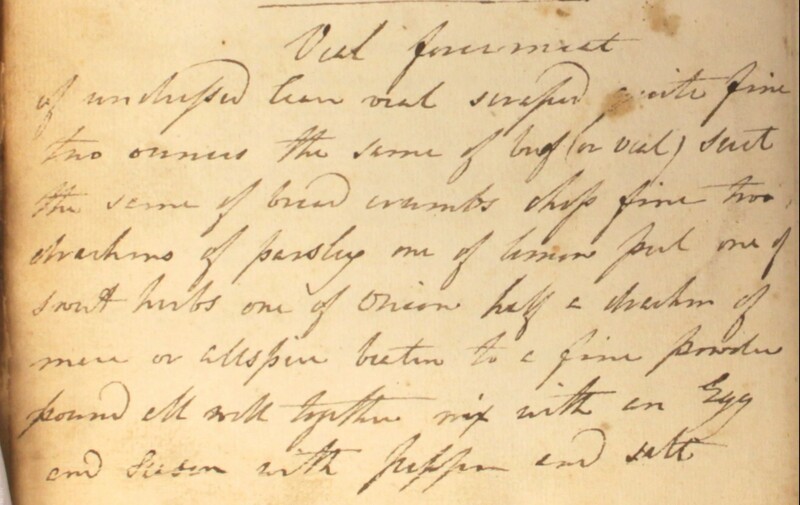 A later, Regency recipe from Dr Kitchiner’s Cook’s Oracle gives a very similar method, with just a couple of tweaks in the flavouring. The quantities are different: this makes less than a quarter of the mixture proposed in 18th century method. So, unless you’re planning on feeding a veritable army, this may be the recipe to follow! Of undressed lean veal scraped quite fine, two ounces the same of beef (or veal) suet, the same of bread crumbs. Chop fine two drachms of parsley, one of lemon peel, one of sweet herbs, one of onion, half a drachm of mace or allspice beaten to a fine powder. Pound all well together, mix with an egg and season with pepper and salt.